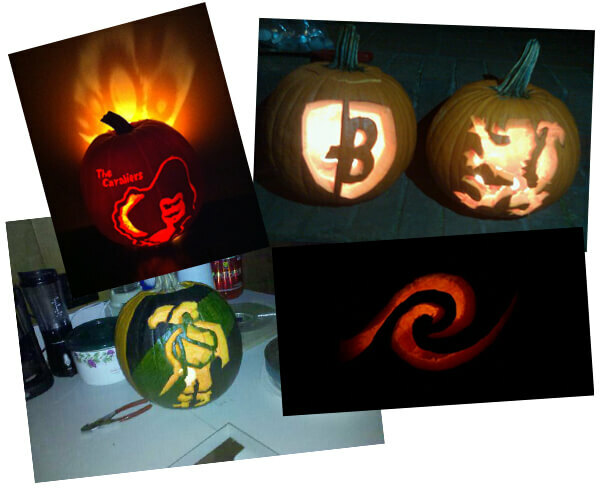 Several drum corps fans submitted these Halloween themed creations over the weekend. Dustin H. submitted the green and black Cavaliers pumpkin. Dean C. wrote: I spent part of my Halloween weekend carving this Cavaliers pumpkin. I'm going to be a fourth-year member of the trumpet section at the Cavaliers this coming summer (2011). The gears behind the pumpkin aren't Photoshopped. They are actually carved in the back of the pumpkin which created the shadow behind it when the light is cast through. The pumpkin turned out great, and I couldn't have done it without the help of my wonderful girlfriend Kayla (former drum major of Teal Sound) and her mother Debbie. Chris G. wrote: This is a picture of two pumpkins that my girlfriend Carlee and I carved for Halloween this year. I marched Boston Crusaders in 2009 and 2010 and she marched Bluecoats the same years. Happy Halloween! Brendan R. wrote: I marched with Pacific Crest this past summer on Euphonium. I made this pumpkin last year before I had even made the corps. I knew that PC was perfect for me, so I thought I'd carve my pumpkin with their logo.